What Is Block Personal Gmail? In many organizations today, cloud computing has turned from a norm to in fact the new religion followed for working effectively, and why not; the advantages of working in cloud environments are so! But with cloud, the legacy of work flexibility is also accompanied by the mounted risks associated with employees’ free data access to their personal email, which can cause serious threats to these firms as this brings in loop the possibilities of malicious data being easily transferred into risky threat zones. This not just intercepts the anticipated data security risks, but also creates an overall data-threatened work system, in which, data thefts are common. What Is Block Personal Gmail? Personal Gmail block is thus a step forward in this direction of cloud security for the purpose of protecting any such ill-aimed and deliberately-damaging data transfers done with the sole intent of dupery. Data thefts are almost inevitable if no cloud data security measures are adopted by firms. Also, as most enterprises today are embracing cloud run systems, so these data-threat gates are left open for attackers. For a secured workplace environment, it is important for firms to adopt some safety measures to guard their sensitive corporate info against such leakages. A very good step ahead in this particular direction is to block personal Gmail access, as it helps in largely averting such easy data transfers, some of which could be driven by malicious intents. What Is Block Personal Gmail? And Why You Should Consider Deploying Personal Gmail Block for Enterprise Security? Firms that are bound by some regulatory regulations like healthcare firms abiding by HIPAA laws etc., always remain in an apprehensive state of their sensitive data being migrated to cloud with data leakage threats always hovering around. For any crucial information being dissipated in any corporate premises, IT admin always wants to prevent the employees from accessing their personal Gmail accounts, and want that they only access the organizational accounts, which have been provided to them by that particular organization. However, a persistent challenge rests now with ultra-flexi cloud models being introduced into the working systems, which is giving air to much more flexible user access than before. This, thus, calls for an action on the part of the organizations to stop their users from accessing their personal Gmail accounts; What Is Block Personal Gmail feature of a CASB solution to block personal Gmail access is thus needed. Considering this need and for meeting these challenges, it is thus pretty evident that enterprises must consider deploying Personal Gmail Block for bringing about overall enterprise security. 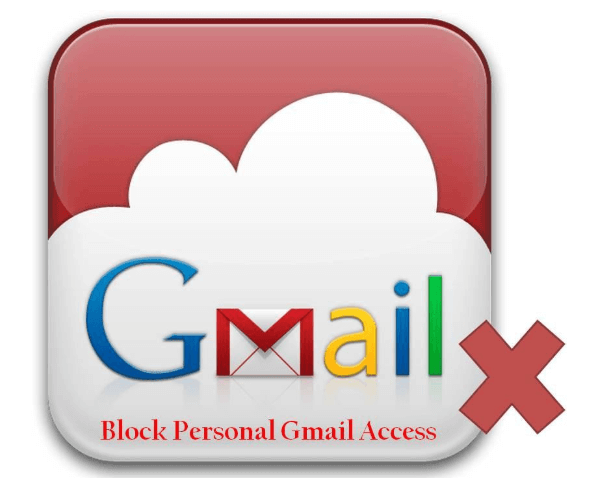 Personal Gmail block is a feature include in the Access Control module of CloudCodes CASB solution, which ensures cloud security, once deployed. What is being faced nowadays is that whilst working with cloud-run services, employees tend to use their personal Gmail accounts without any restrictions imposed on them. A way around this problem is to use CloudCodes CASB solution that has a feature for Personal Gmail Block nested under its Access Control module, thus helping enterprises combat this fear with ease by gaining a way to block personal Gmail access. Any attempts made towards the violation of this Gmail-block policy are reported and such reports are generated to the IT. This solution is implemented with no such hardware dependencies. CloudCodes Personal Gmail Block feature works as a cloud data security cushion which empowers organizations to avert any such malicious data theft or breach attempts. Implementation of any of the corporate policies not to use personal Gmail accounts within offices could become a highly costly one by using expensive firewalls. This can indeed be a kind of show-stopper for startup firms and SMBs, thus preventing them altogether from venturing into the cloud environment. CloudCodes CASB solution with its Personal Gmail Block feature helps provide these firms with this extra security layer, thus enabling them to adopt cloud without any such doubt!